It's been so nice outside for the past two days that we've actually opened the windows and sunroom and are enjoying a nice breeze through the house. Of course, it's supposed to rain tomorrow so there'll be none of that going on. Ah, well. I'm glad I'm getting to enjoy the mild weather while it's here. 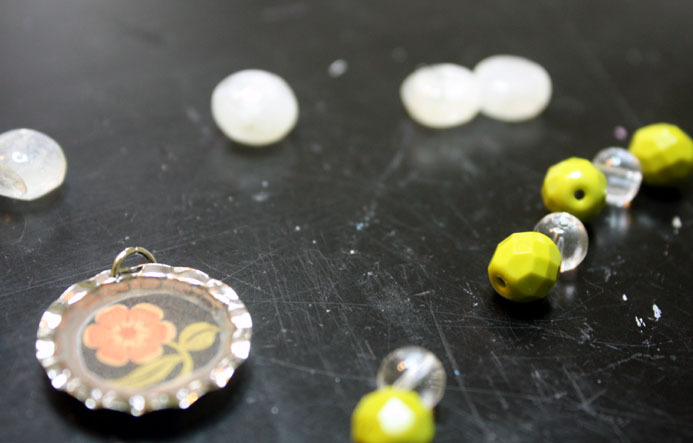 There's another reason to enjoy today. . .It's Bead Table Wednesday! What's on my Craft desk today? Take a look. I decided to pull out the resin charms I made a few weeks back and see what I can make out of them. As you can see above, I've got one bracelet made and a necklace in the works. 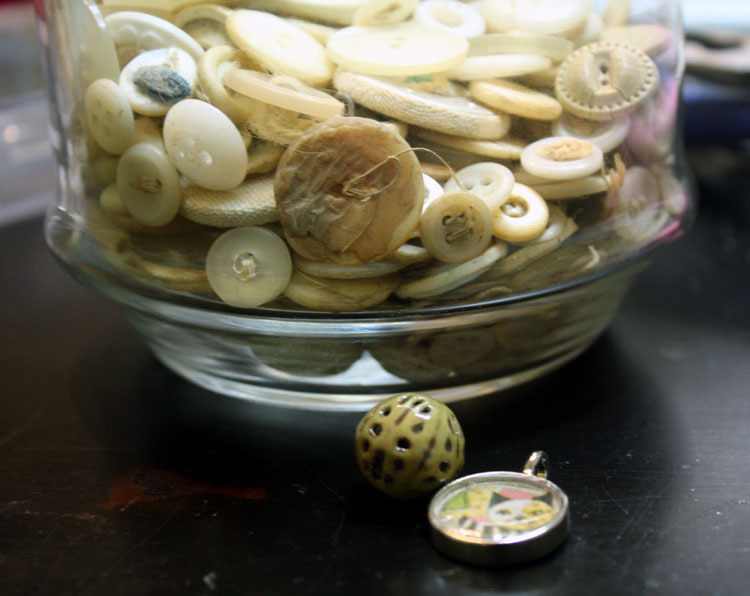 Yup, there's going to be buttons in that necklace. At least that's what I have planned. We'll see how that pans out. 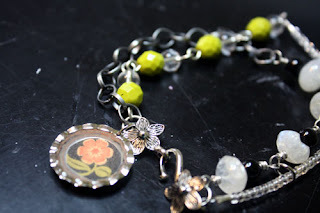 Head on over to the Bead Table Wednesday Flickr group to see what everyone else is playing with on their bead tables. 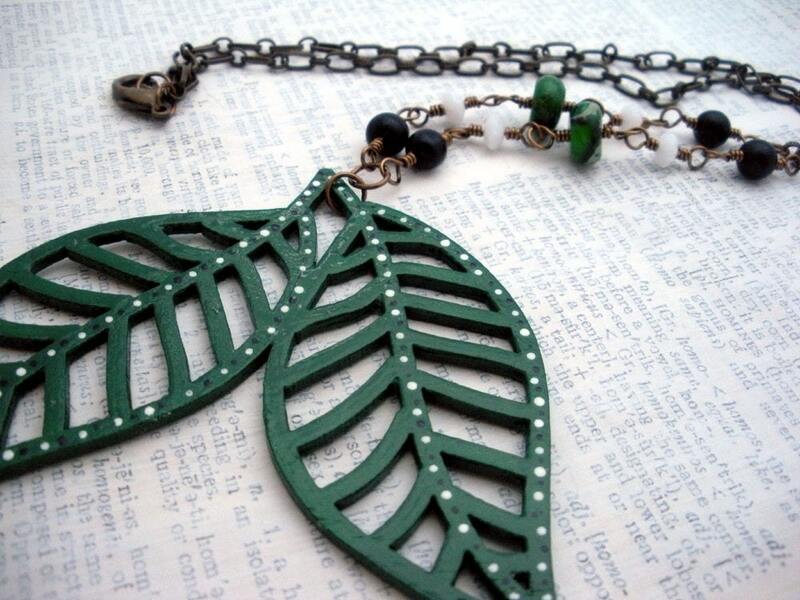 With the lovely weather, I just had to list this nature-inspired necklace today. It's a particular favorite of mine! OH! I have to share the picture of this little guy that Pat spotted in our backyard this morning. 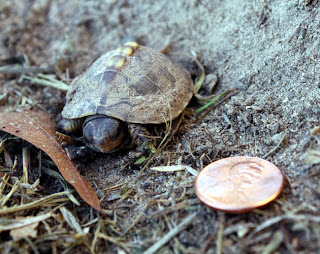 I threw the penny down there to give you an idea of the scale of his tininess!! omg, that turtle is the cutest thing ever!! Cute resin kitty charm and adorable wee turtle!!! Faith - I know. I'm so glad the hubs pulled me outside to see him, even though I was still in my jammies. OMG TINY TURTLE!!! He is the most adorable thing that I've seen in a long, long time. Amazing you guys spotted him; he's so flippin' tiny! I KNOW! I sooooo wanted to keep him, but hubs wasn''t convinced it was the best idea. And, he was only lucky enough to spot him because the poor baby was hiding under our trash can when Pat went to take the can to the street. I'm glad I got to snap some shots when I did. When I went back out to look at him, he was nowhere to be found!